UNITED NATIONS - Two weeks into the transition period, all eyes at the United Nations are on Secretary-General-Designate Ban Ki-moon (pictured left) and his picks for the top management. South Korea’s former Foreign Minister will be swearing in in front of the General Assembly on 14 December before taking over from Kofi Annan in January. And his transition agenda is getting tighter and tighter: he has to familiarize with the Secretariat, as well as staff procedures; interview candidates for senior posts; and meet with ambassadors and representatives of regional groups. “My mission, my plan at this time is to take charge of the transition until the end of December,” Ban Ki-moon told reporters after his first transition meeting with the President of the General Assembly, Sheikha Haya Rashed Al Khalifa. The Secretary-General-designate said he had “a very good discussion” on issues related to the reform process and the role of the Organization around the world. But one of the most daunting challenges that the soon-to-be Secretary-General is facing at the moment is the appointment of the senior staff, under-secretaries-general and deputy secretary-general in particular. The five permanent members of the Security Council – namely China, France, Russian Federation, United Kingdom, and United States – have all expressed their interest in key positions, such as Political Department and Management. And the list of pretenders grows by the hour. There are already speculations about the person who will replace Annan’s right hand, UN Deputy Secretary-General Mark Mallock Brown. Although the United Kingdom seems to be pushing for another Brit as UN second in command – in particular if they won’t be able to get back the Political Department –, Ban Ki-moon’s advisers are not revealing any candidate. The post of Deputy Secretary-General was created almost 10 years ago with a specific set of responsibilities, spanning from assisting the Secretary-General in leading and managing the operations of the Secretariat, to ensuring intersectoral and inter-institutional coherence of activities and programmes that cross functional sectors. The post was entrusted to Canada’s Louise Frechette, who remained in office until earlier this year. Annan was at the beginning of his term and the appointment of a woman as first Deputy Secretary-General was seen as a strong willingness to re-balance the Secretariat and improve the status of women in the UN-wide system. The post, however, was given to Mark Malloch Brown after Frechette’s resignation, a move that provoked extremely negative reactions within Un circles. 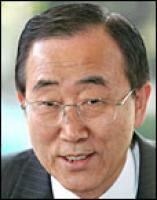 The appointment of his Deputy would be one of the most important top management decisions for Ban Ki-moon. In a recent interview with London newspaper The Times, the new UN chief said he was leaning towards appointing a woman as his right hand but didn’t mention any possible candidates. Uncertain is also the future of outgoing Secretary-General Kofi Annan. Earlier this month, Annan ruled out any tilt at the Presidency of Ghana, where he is originally from. “There is a very long holiday in my future for my wife and myself, I think we deserve it,” he said during his trip to Nairobi this past week. “So I'll take a long break and then try and organize a life that will give me a balance between reflection and action, and I don't think being President of Ghana will give me that kind of life.” Annan also said that he will focus his efforts on Africa’s future – once he leaves the Organization – working on issues such as development, poverty, and health. Annan has repeatedly said that he and his wife Nane, a Swedish lawyer and artist, will move to Ghana… But not for long, according to some. A senior diplomat at the UN, speaking on condition of anonymity, has suggested that the outgoing Secretary-General might be interested in some sort of good-will post, maybe related to Africa. The UN Staff Union represents a total of more than 20,000 people working at Headquarters and on the field. Find more from Andreas von Warburg on InfoPages.